We meet under the most peculiar of circumstances. 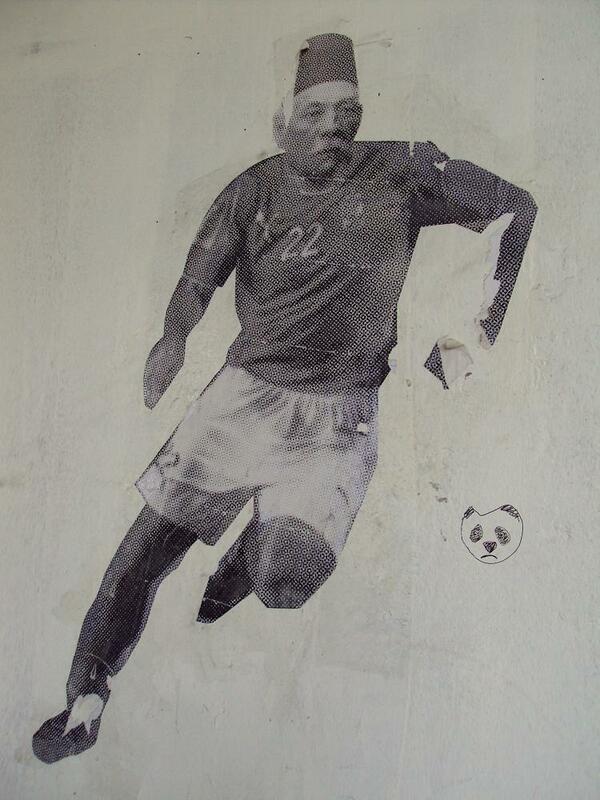 I’d been in touch with Sad Panda over Twitter about photographing his graffiti in the Cairo area of Masaken Sheraton; yet I, having the mental compass of a duck in the desert, get immediately lost. 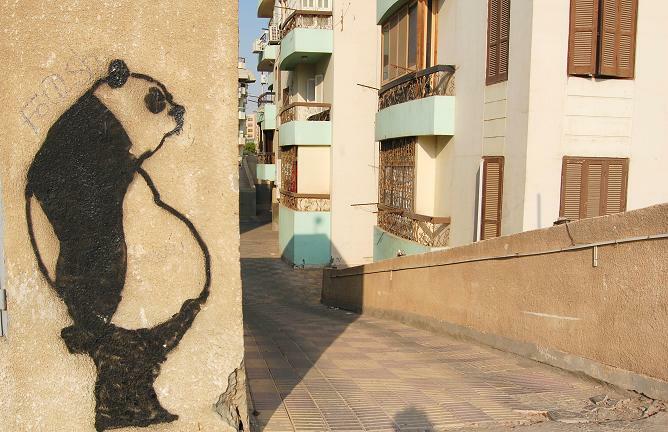 So he puts me in touch with a friend called Hatem, who will show me Sad Panda’s work in the neighbourhood, but first Hatem asks me if I’d like to see a graffiti artist cutting up stencils. I say yes. 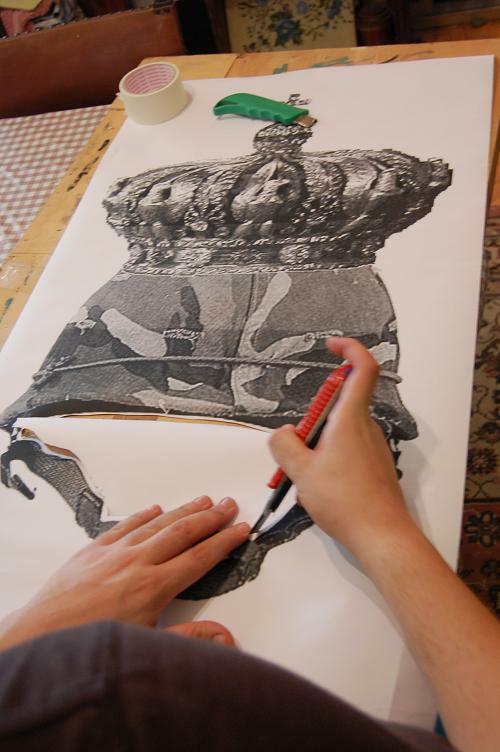 He chain-smokes, his mother offers me cold orange juice, I try not to step on the cat lazing on the floor, and I snap away at my camera as he patiently cuts through the outline of his new stencil. This is why I find him peculiar, or better, intriguing. For someone who says he isn’t a people’s person – he avoids public transportation and crowded spaces, which make him seriously depressed to the point of a phobia – he is incredibly friendly and warms to me instantly like he’s known me for years. And for someone who says that he is depressed a lot and ends all his tweets with a sad face, he is surprisingly good humoured and easy going. He’s somewhat paranoid about his true identity being revealed, and asks me not to take photos of his face or disclose details about him, a common strain that I find in other graffiti artists I’ve met. Just get him talking about his graffiti and he loses the paranoia and talks animatedly. He came up with the sad panda persona because that was his nickname in school, due to his size and his melancholic demeanour. His neighbourhood of Masaken Sheraton is his playground, his turf where he can paint freely to little if any reproach. We drive through the winding streets, as I spot a pair of eyes peeking from a lamppost, a Baradei head on a telephone box, Suzanne Mubarak, Safwat Sherif and Zakareya Azmy on electricity boxes. 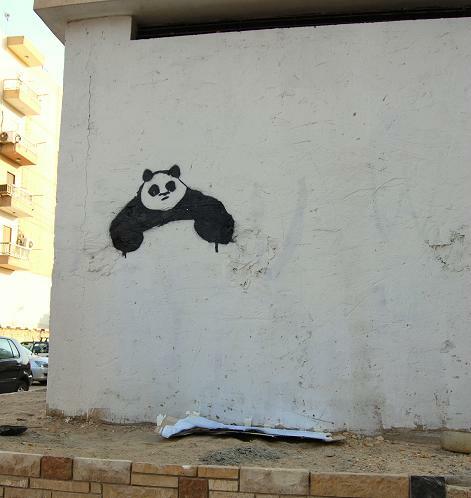 And of course, the proverbial panda shape everywhere. He doesn’t like his art to be pigeon-holed or politicized, even if it is political. 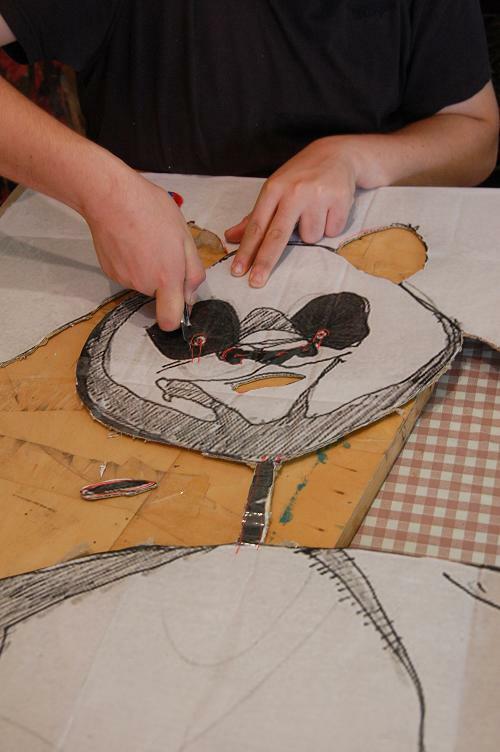 He prefers to focus on the comedic element of his work, and avoids work that spells out its message. 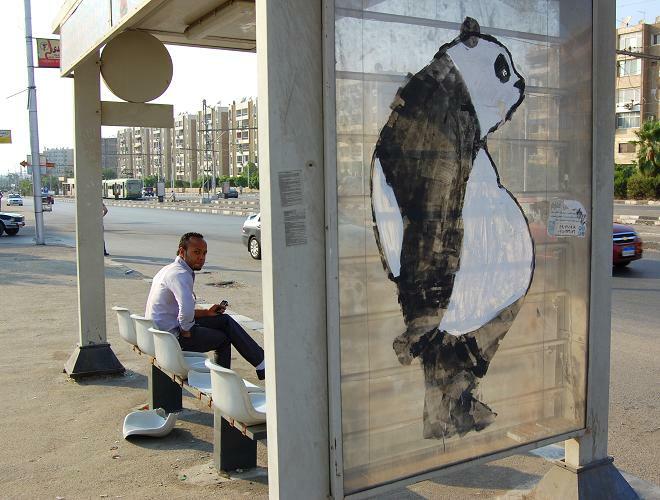 Hatem uses relatable local personalities in his images that the average man on the street can understand: Saad Zaghloul, Abdel Halim Hafez, the politicians, the protestors, the military; all accompanied by a small panda doodle at the bottom as his signature. 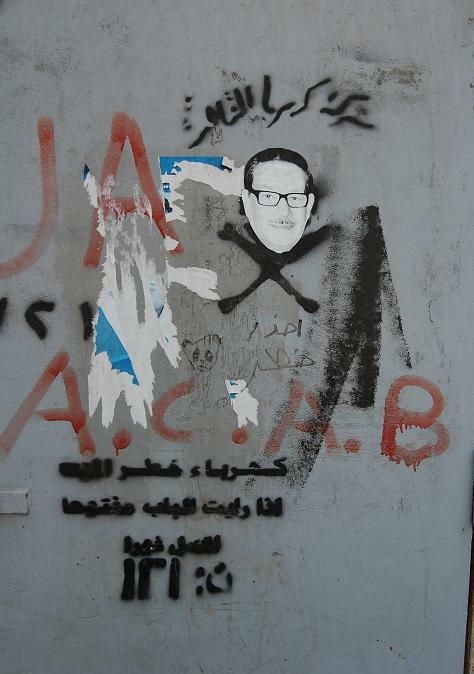 One exception is Che Guevara the Salafist, an icon that not necessarily everyone in Egypt would recognize. 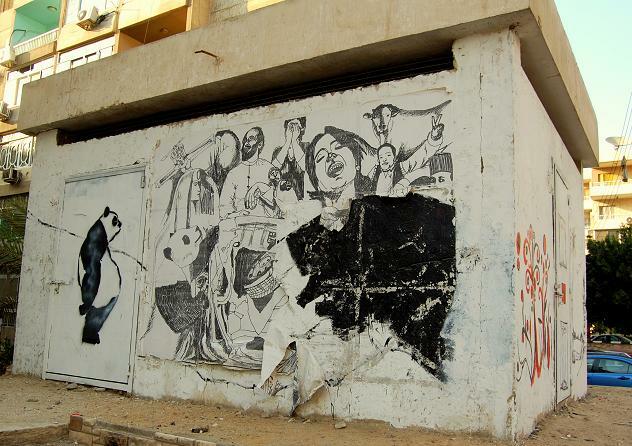 He adds that the Egyptian culture lacks street art sophistication, and the only posters and banners people are used to seeing are of political banners or posters for elections. 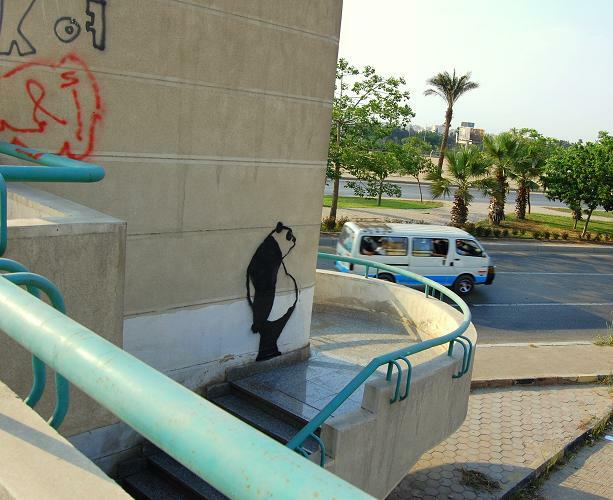 Things have changed for Hatem’s graffiti escapades since the revolution. Before he had to be careful and clandestine, and work in the dark, now he can paint on main streets in broad daylight. 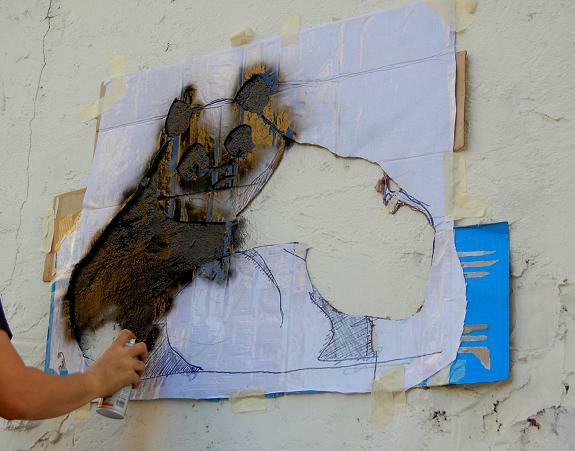 ‘When [people on the street] find me painting a panda, they don’t really react much, it’s not like I’m painting the mask of freedom, it’s just a panda,’ he insists. There is no clear law criminalizing vandalism in Egypt, merely a law prohibiting destruction of public monuments and private property, as far as I know. 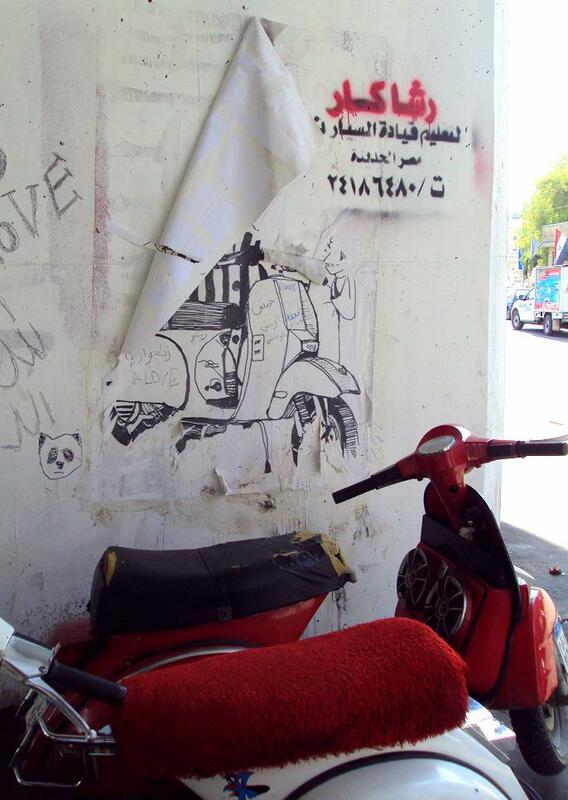 Your maximum fine is 50LE if you actually get caught, and you may be forced to repaint the wall you just spoiled. 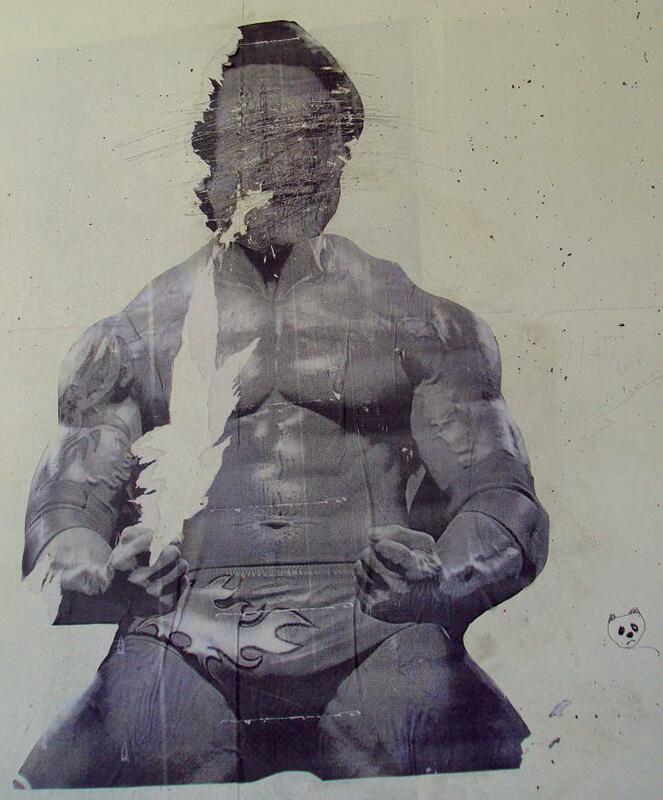 ‘But you won’t be condemned to death for graffiti,’ he shrugs. 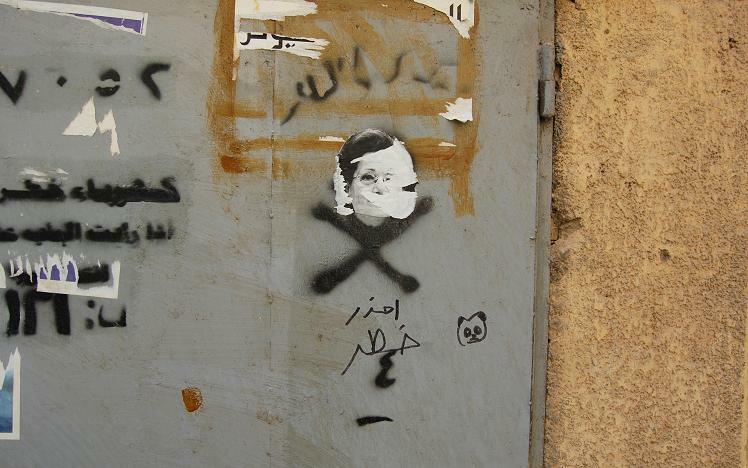 Safwat Sherif, Former Speaker of Parliament: Warning: Danger. On electricity box. 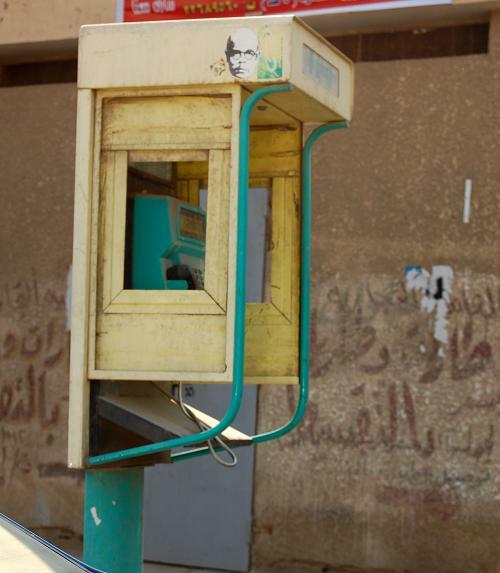 Baradei's face on the side of a telephone box, masaken Sheraton. Gamal Mubarak- Warning: Danger. 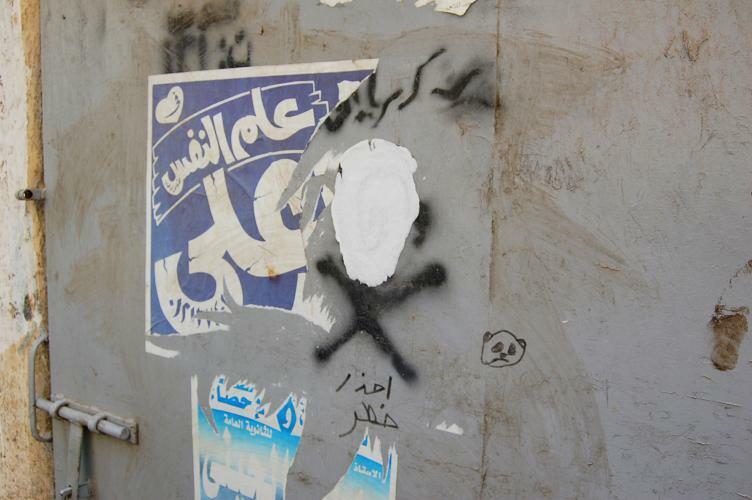 Sighted under Merghani Bridge in mid-June, the face was scratched off one week later. Libyan Tyrant Muammar Gadafi gets the McDonalds treatment, 'Leave Ali' the woman's sign reads. Located right across from McDonalds Merghani. 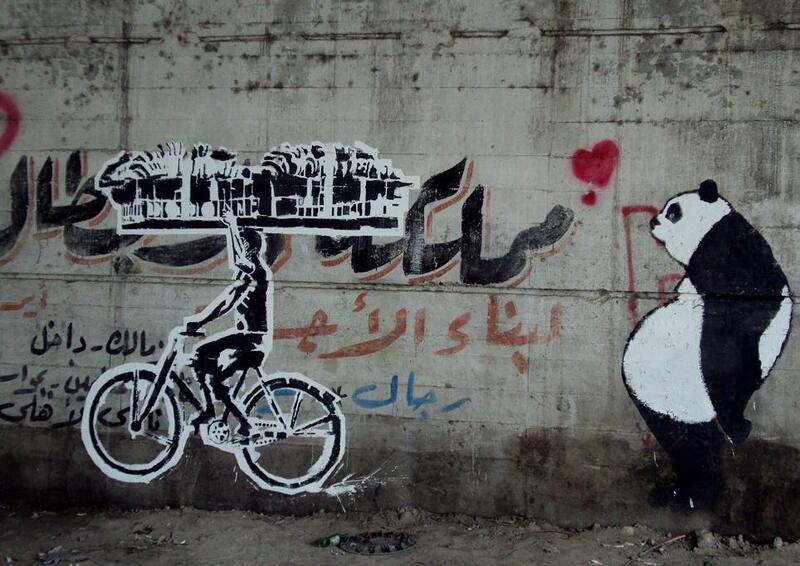 One of his first posters to go up under Merghani Bridge, this piece dates back to around the January 25 revolution. He's surprised it lasted that long. 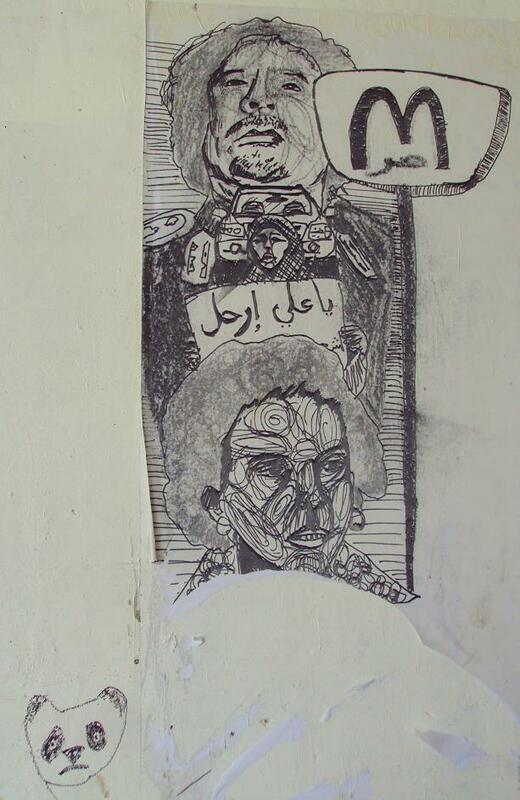 This entry was posted in Street Art Fascination and tagged Cairo, clandestine, dark, Egypt, graffiti, Masaken Sheraton, mask of freedom, Mubarak, political, Sad Panda, stencil, street art. Bookmark the permalink. 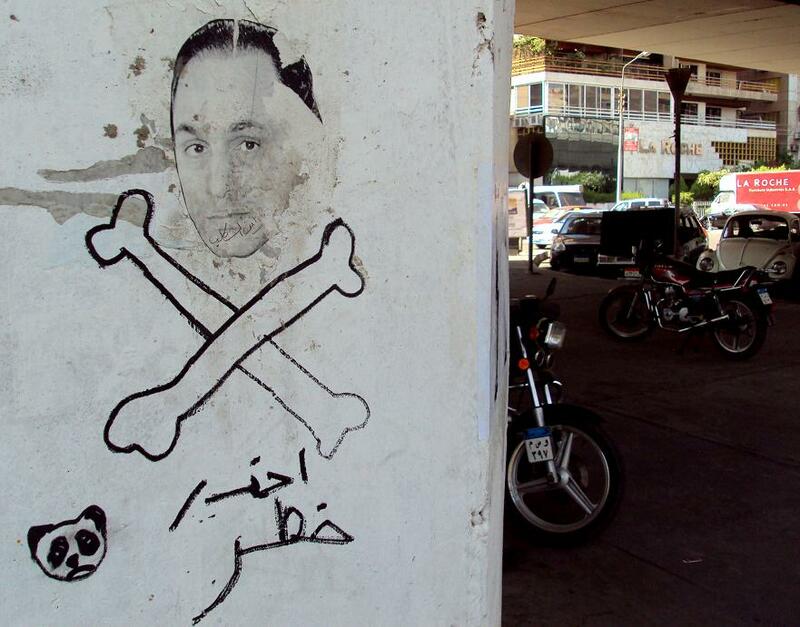 I think the face in the graffiti with the first caption is Safwat al-Sharif. great piece – thank you !